I had no idea how precious last Easter would be to me... it was the last Easter I would be able to spend with my dad, before he would be taken to Heaven just a couple short months later. 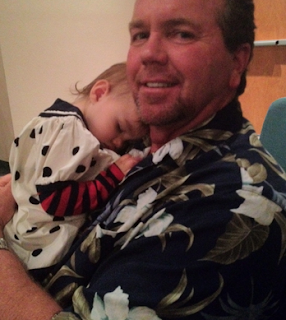 I remember Ellie slept on my dad's shoulder while we sat in church. 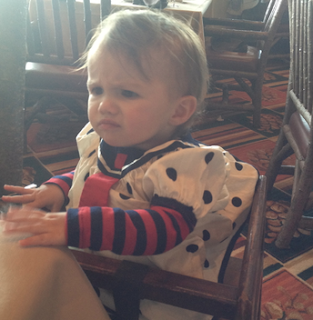 And after church my dad said we should go eat at the buffet brunch at a restaurant on the water. Neither one of us looked at the price of the buffet when we we sat down, there was no sign for the price and no menu. But as people received their bill you could just hear people gasping at the price! And when we got our bill, my dad and I did the same....I can still see my dad's face and he said: "WHOAAAAAA!" and kind of shook his head and started laughing, as he looked at our bill. I can't remember how much it was exactly and that doesn't even matter now. But I remember my dad saying, "well at least we're makin' memories! "....my dad always said that when anything was good, or when something went wrong- we were always making memories. As my nose begins to tingle, like it does when you're about to cry and tears are gathering in my eyeballs...there is a good ending to this story. I do know, that Easter, is when I celebrate, that Jesus rose from the grave, after dying for our sins, so that we could be forgiven and when we ask him into our hearts and to forgive us for all the junk and bad stuff we do and think and say, he washes away all our sins, guilt and shame...remembers it no more, and stretches out his loving arms and promises to stand with us, to be our strength and to fill us with peace when life gets unbearable...until the day, like the day when I got the call about my dad, and he went to be in the most wonderful place to spend eternity...in heaven. Life got unbearable months after this picture below was taken. Hearing that voice say over the phone, that my dad was no longer on this Earth- felt unbearable, it felt more than unbearable- I didn't want to do it, I didn't want to live through each second. I didn't want this to be real. I just wanted my dad. I didn't want to know that there would be no more memories to make with my dad, that was too much for my heart to take in. Time does not heal the loss of a loved one- it takes away the sting that you first feel. A sting so painful that you don't want to wake up and know it's there. There are waves of emotions and moments when you just miss that person so much. Not a single day goes by that I don't think about my dad, I think about him all the time, and I miss him all the time. I know this Easter will be precious to me. When this life, with it's hardships, disappointments, heartaches, heartbreaks, frustrations, hurts, sickness and pain is over.....I know, I can't wait to celebrate in Heaven. If I could tell my dad right now....I'd say: I love you so much dad, and I love each memory we made! It's a priceless- PRICELESS treasure in my heart. No one can steal them, break them, burn them or take them away from me...I will keep making memories, because that's what you'd tell me to do! So until I see ya in heaven, I'm gonna make some good memories in your honor dad! If you've lost a loved one...please feel my heart going out to you. I know what your heart hurts like. Cherish every precious memory, for no one can take them away. Their love is always in your heart, always. And even though tears are running down my face, I'm cheering you on, sending you the biggest hugs and telling you...we can do this! We will take their memories and let their love just add to love we will share with all those around us. There is no greater strength on Earth, than a heart that been through devastating pain, and keeps on going with a smile on their face, the face that has been washed in tears. Because the heart of one who has lived through heartbreaking things, and still shares love, is a heart that grew bigger as it healed from being torn open. You only have two options: GROW BITTER, or GROW A BIGGER HEART! People with big hearts are the ones who don't let things stop them, they pour love out to those around them and the joy they feel, from bringing others joy, becomes the song of their heart...a heart that looks, not just at their hurt, but looks at ways to help brighten others days too. This world is full of hurting people everywhere you look...try to be a little nicer, say something kind and offer an extra smile...you never know the hurt in someone's life, that they don't have labeled on a badge on their shirt. No one knew as I walked through the grocery store after I had spent the day packing up my dad's things, how hard that day had been, but someone smiled and they have no idea how much that meant to my heart. 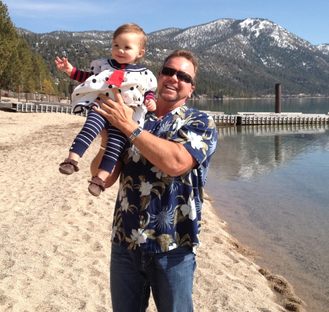 I will always smile when I think of last Easter, and me and my dad looking at the bill...and then saying: "hey, we're makin' memories...." and laughing!